Accurately recreating the behaviour of a valve guitar amp in the digital realm is an extremely tricky task, partly because that behaviour is complex, and partly because guitarists are a hard bunch to please. Digital modelling has come a long way, and the best software amps and hardware modellers can produce sounds that are indistinguishable from a miked-up amp, but many guitarists still complain that crucial aspects of the 'feel' of a real amp — the many intangibles wrapped up in playing dynamics and tonal response — are lacking. The Kemper Profiling Amplifier (KPA) takes a new approach to the challenge of fitting real amps inside a digital box. Designed by Christoph Kemper, founder of Access Music Electronics and creator of the popular Virus synth line, the KPA promises to capture the exact sonic characteristics of any amp by playing a series of test signals through it and analysing the result. Rather than trying to model the entire behaviour of the amp, the idea is to take a detailed snapshot of a specific setup (the amp's controls at specific settings, and the amp miked up in a certain way) and recreate this exactly. What's more, the KPA allows users to create and share their 'profiles', offering virtual access to a potentially endless range of amps around the world. 'Highly anticipated' scarcely does the KPA justice! The rear panel is crammed full of connectors for the different sections of the device, and each has its own ground-lift switch. When using, saving or recalling sounds, you'll be dealing with one of the KPA's 'rigs'. 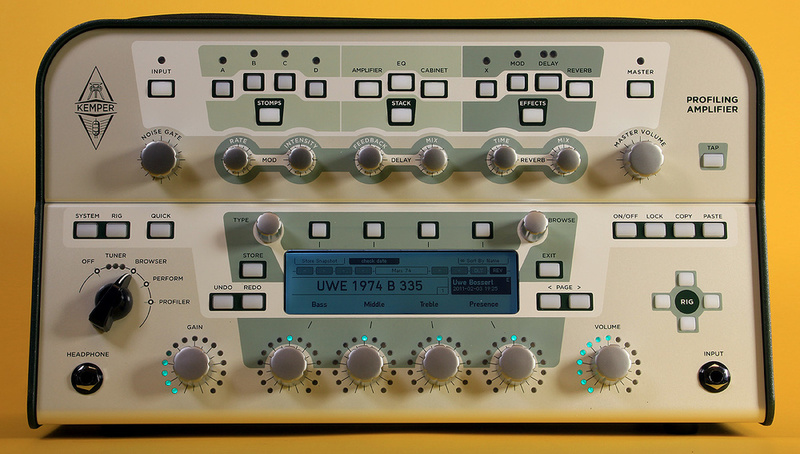 Each rig (up to 1000 of these can be stored) contains your complete signal chain and is divided into three sections, as seen across the top half of the front panel. The Stomps section comes first, with slots for up to four mono effects. Next, the Stack contains your chosen amp and cabinet profiles — the profiling process captures both at once, then separates the two elements so you can mix and match — and an EQ section common to all profiles, with bass, middle, treble and presence controls. Finally, the Effects section has four more effect slots, this time with stereo capabilities. While the last two are reserved for delay and reverb, the 'X' and 'Mod' slots can host any effect. Navigating around your rig is very intuitive. Pressing any of the backlit buttons switches that item or section on and off — so you could, for example, switch the Stack off and use the KPA solely as an effects processor — and holding the button down for half a second calls up detailed settings on the LCD screen. Here, the surrounding context-sensitive buttons allow in-depth adjustment of settings. The store button lets you save any element and all its settings, whether it's an amp, cab or effect, or a whole Stomp, Stack or Effects section, as a preset. Copy and paste buttons let you move elements from one rig to another. By default, the four rotary controls below the screen give you the amp's EQ settings, to go with the dedicated gain and volume knobs either side, so you can just reach out and make adjustments on the fly as you would with an analogue guitar head. 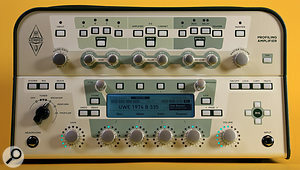 There are further dedicated knobs above, for the noise gate, master volume, and mod, delay and reverb effects slots. 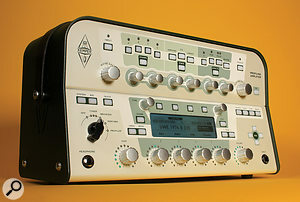 This welcome sense of hands-on control underlines the fact that the KPA is very much designed as a stand-alone device; there's no computer audio interface built in, and the USB socket on the back is just for installing firmware updates, sharing profiles and rigs with others and backing up your settings. There's no shortage of connection options at the rear, however. The S/PDIF digital I/O is joined by a selection of analogue ins and outs with (very sensibly) individual ground-lift switches. The main stereo out (on XLR or quarter-inch jack) is joined by a mono monitor output. With half an eye on live use, the monitor out has its own level control to feed a stage monitor. You can also switch off cab modelling for the monitor output only, while using it to feed a power amp and guitar cab. The quarter-inch direct output carries the original guitar signal, straight from the input and untouched by A-D conversion. This is used during the profiling process to feed the amp being profiled, but it also provides the opportunity to capture that signal for re-amping later. The XLR/quarter-inch return input receives the mic signal during profiling. It's worth noting, if you want to use a condenser mic, that the return input does not provide phantom power, but this will be a moot point if, as I did, you want to use an external preamp for additional level and EQ control. When playing as opposed to profiling, the direct output and return input, together with the quarter-inch alternative input, act as an external effects loop that can be positioned in one of the Stomp effects slots (mono only) or in the post-stack X or Mod slots (mono send, mono/stereo return). Completing the busy back panel, there are two quarter-inch-jack inputs for connecting expression pedals or one- or two-button momentary footswitches. 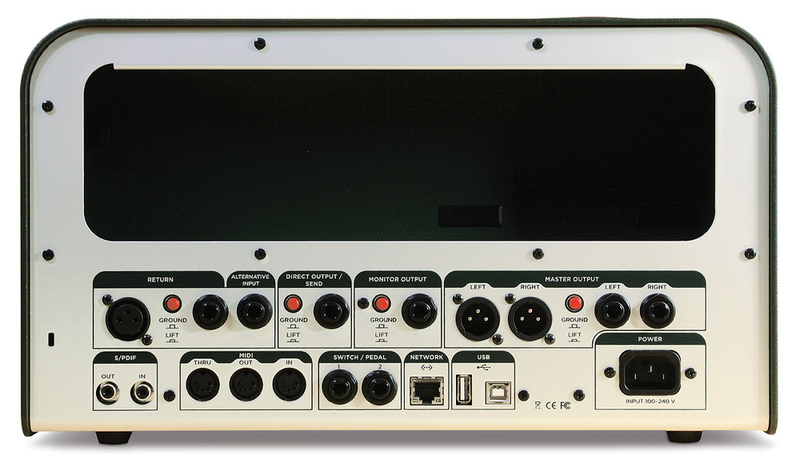 MIDI In, Out and Thru sockets offer further remote-control possibilities. While 128 program change numbers can be freely assigned to switch between individual rigs, I was initially disappointed that control change implementation was limited to little more than bypassing individual effects. However, recent firmware updates have been gradually expanding the possibilities here and will hopefully continue to do so. I can't see any reason why any parameter inside the box should not theoretically be available for external control, and the ability to map things like delay time or modulation rate to an expression pedal would open up great creative possibilities. Kemper say that another mode, called 'Perform' (which sounds as if it will be geared towards live use, but I was unable to confirm this at the time of writing), will be added by a firmware update in the near future, along with tweaks to improve browsing through presets and the means to rearrange and rename rigs and profiles outside the box (entering text letter-by-letter via a rotary knob is a real grind!). That may all have come to pass by the time you read this, as Kemper have so far seemed very responsive to feature requests and bug reports, releasing a new update every two weeks or so. There are two ways to look at this: anyone inured to regularly dealing with driver updates and software patches will probably appreciate Kemper's ongoing effort; but on the other hand, guitarists used to dealing with real, physical amps may wonder why the thing they've just bought needs updating at all. I lean towards the former, more positive view, partly because Kemper seem committed to continually improving the product, but mostly because, a few minor gripes aside, the KPA already does so much, and does it very well indeed. The front panel of the Kemper Profiling Amp. The KPA comes with well over 150 rigs, covering the full spectrum of benchmark amp tones, both vintage and modern. Frequently, there are multiple profiles of an amp, captured using different mics or set for different levels of gain. Most are presented in their natural state, and while there's also a healthy selection of effects-laden sounds, it shows Kemper's confidence in the strength of the amp profiles that they don't feel compelled to make each preset an effects extravaganza. And 'natural' is definitely the word. The sounds on offer, both clean and overdriven, are extremely convincing in terms of both tone and dynamics. It's always a mistake to expect that 'amp in the room' feeling from a digital modeller or amp simulator. What the KPA offers instead is an 'amp next door properly miked up' feeling, which is infinitely more useful in a recording context. The profiling process captures only one set of settings on the amp, but this is just a starting point. The EQ section proves very effective when making adjustments to suit, say, a brighter or darker sounding guitar, and delving into the detailed amp settings lets you adjust things like pick attack and compression characteristics — something no physical amp can offer. More extreme adjustments will naturally take you further away from the character of the original profile. Select a clean Vox AC30 profile, then turn the gain up 50 percent, and what you get does not sound like a maxed-out AC30 (it's fuzzy, aggressive and actually pretty interesting). This is where the wisdom of multiple profiles becomes apparent: if you want the authentic AC30 drive sound, that's been profiled too, in multiple flavours. But if you want to get more experimental, the KPA's controls cover a range that is wider than any amp in the real world. Compared with the profiles list, the effects menu is much smaller, but still pretty comprehensive. Rather than providing umpteen phaser effects, for example, Kemper have sensibly provided one phaser with an array of adjustable parameters. There's a larger selection of nicely modelled boost, overdrive and fuzz stomp-boxes, and you can always plug in your own effects to expand what's on board. The stereo delays and reverbs are very good but lean towards the shiny, studio-style side of the fence, and the absence of a spring reverb simulation seems strange. More effects are promised, but even as it stands, there's not a lot that the effects section can't do. The process of creating new amp profiles is surprisingly straightforward. Once the amp is set for the sound you want and miked up to your satisfaction, the KPA runs through a brief sequence of test tones and that's it: job done. One of the cleverest aspects of the system is that your guitar is connected, via the KPA, to the target amp throughout, so you can play through it while adjusting amp settings and the mic position. More importantly, the KPA actively encourages you to switch back and forth between the amp and the profile you've created, for direct comparison. With this initial process complete, you can further refine your profile by letting the KPA listen to you strum a few chords, and tweaking various settings for distortion and dynamics. Following the example set by the supplied sounds, I decided to create two profiles of the small valve amp I often use for recording, set at its clean and overdriven 'sweet spots'. Not only was I impressed by how quick and easy this was, but once refined, the resulting profiles were literally indistinguishable from the miked up tone. This prompts several big realisations. First, the technology really does work! Second, because the KPA profiles not just the amp itself but the whole setup — amp, mic, room and all — the more effort you put in at source, the more you will be rewarded. Third, once I've put that effort in and captured those profiles, I potentially never have to go to the trouble of miking that amp up again — at least until I want a sound from it that I've not yet profiled. But what makes the KPA truly unique is that these profiles are not digitally modelled presets that I've created and saved. They are my amp, in my studio, miked up the way I like it, and at my disposal 24/7. You can also share your profiles online, and in the time I've had with the KPA, I've downloaded a dozen or so profiles posted by others. All were competent, at least half eminently usable, and a couple very good indeed. That's an impressive hit rate for user-generated content. I suspect some users may jealously guard their self-created riches, but the prospect of a steady stream of new profiles is a tantalising one. 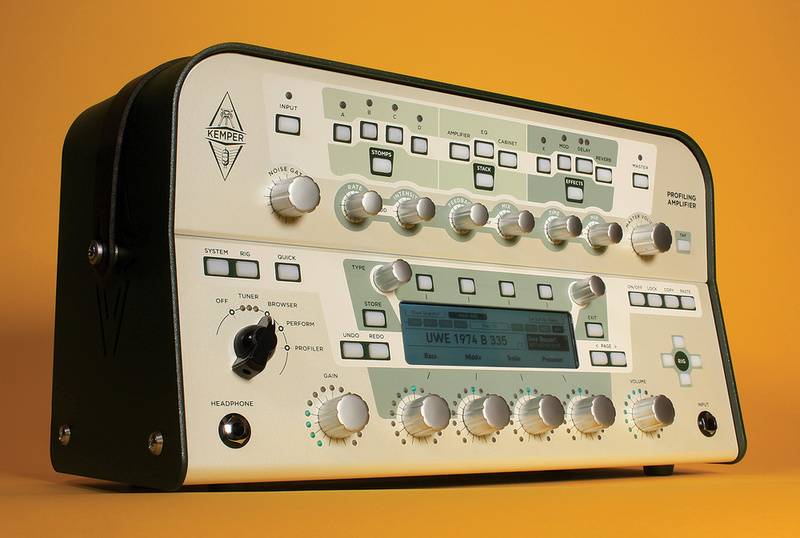 It's hard not to feel excited about the Kemper Profiling Amplifier. There's still some work to do, in making it a little easier to browse profiles and assemble rigs, in improving the options for using external controllers, and perhaps adding a couple of additional effects. Even so, the KPA is a compelling sonic platform for electric guitarists and undoubtedly a major new player on the scene. There's an impressive sense of depth, detail and realism to the amp sounds on offer, both in terms of tone and the way they respond to playing dynamics. But it's the ability to create new profiles that's most exciting, especially if you don't have access to a soundproofed live room around the clock. Even if it means hiring a studio and spending a whole day making profiles, the prospect of having all your favourite settings on your amps (and, perhaps, all your friends' amps too), as they would sound properly miked up, sitting in box on your desk and available at the flick of a switch, is something to really get home-studio owners thinking. What's more, assuming the goodwill of the user community, there's the prospect of being able to plug into any number of profiles of great amps set up in great studios around the world. If Kemper continue to add new sounds and expand the capabilities of the KPA, the sky is the limit. There are plenty of amp simulators around in both hardware and software, but when it comes to doing what the Profiling Amplifier can do, the KPA is out there on its own. Christoph Kemper (CK) has spent the last 15 years developing the hugely popular Access Virus synthesizers, so what made him turn his attention to the challenge of guitar-amp simulation? So how does 'profiling' differ from digital modelling, and what are its advantages? CK: "Modelling, in the technical sense, is bringing the physics of the real world into a virtual world, mostly by defining formulas for the real world and letting them calculate on a real-time computer. I don't know how other companies model their stuff, but I tend to listen to a circuit rather than study it —because by treating models on a theoretical basis, one tends to overlook some very important side-effects that can later be heard clearly, so you end up listening to it anyway. I did our models of the distortion pedals just by listening, and matching my model just by ear. In contrast, profiling is an automated approach for reaching a result that is probably too complex and multi-dimensional to achieve by ear, or by capturing the behaviour of individual components in isolation. Sounds are impressively realistic and dynamically responsive. Deep profile adjustment parameters allow sophisticated tone shaping. The profiling technology not only works, but is incredibly ease to use. The ability to create and share profiles. Awaiting updates to activate the Perform mode and to improve external control capabilities. An external editor for renaming presets would be very welcome. The KPA is a significant and exciting development in guitar-amp simulation. It allows the user to accurately capture the sound of their favourite amp and mic setup, either to faithfully reproduce it or to transform it beyond the capabilities of the real thing. Aside from the fact that users can easily record high-quality guitar sounds, the fact that they can share profiles means a potentially infinite library of individual amp tones. Kemper GmbH+49 (0) 2361 937 6824.